Kubanek J, Shukla P, Das A, Baccus SA, Goodman MB. 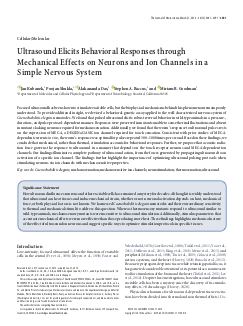 Ultrasound Elicits Behavioral Responses through Mechanical Effects on Neurons and Ion Channels in a Simple Nervous System. The Journal of Neuroscience (2018), 38, 3081-3091. PMID: 29463641. 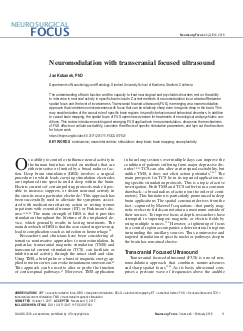 Kubanek J. Neuromodulation with transcranial focused ultrasound. Neurosurgical Focus (2018), 44, E14. PMID: 29385924. Kubanek J. Optimal decision making and matching are tied through diminishing returns. Proceedings of The National Academy of Sciences of The United States of America (2017), 114, 8499-8504. PMID: 28739920. 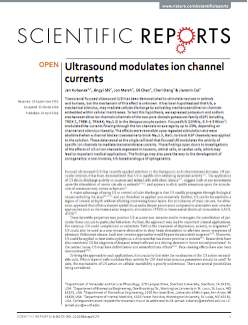 Kubanek J, Shi J, Marsh J, Chen D, Deng C, Cui J. Ultrasound modulates ion channel currents. Scientific Reports (2016), 6, 24170. PMID: 27112990. Kubanek J, Snyder LH. 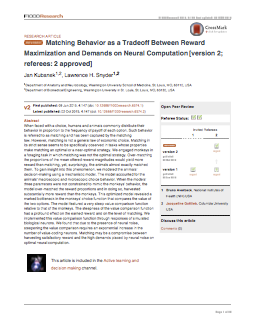 Matching Behavior as a Tradeoff Between Reward Maximization and Demands on Neural Computation. F1000Research (2015), 4, 147. PMID: 26664702. Kubanek J, Snyder LH. 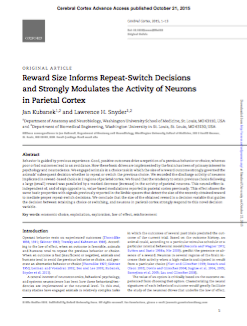 Reward Size Informs Repeat-Switch Decisions and Strongly Modulates the Activity of Neurons in Parietal Cortex. Cerebral Cortex (New York, N.Y. : 1991) (2017), 27, 447-459. PMID: 26491065. 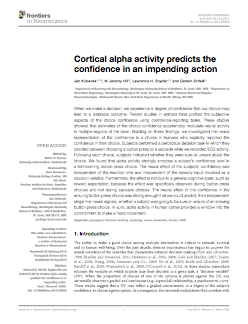 Kubanek J, Hill NJ, Snyder LH, Schalk G. Cortical alpha activity predicts the confidence in an impending action. Frontiers In Neuroscience (2015), 9, 243. PMID: 26283892. 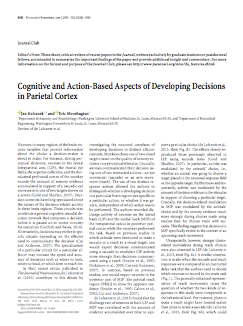 Kubanek J, Mooshagian E. Cognitive and action-based aspects of developing decisions in parietal cortex. The Journal of Neuroscience (2015), 35, 8382-3. PMID: 26041907. Kubanek J, Snyder LH, Abrams RA. 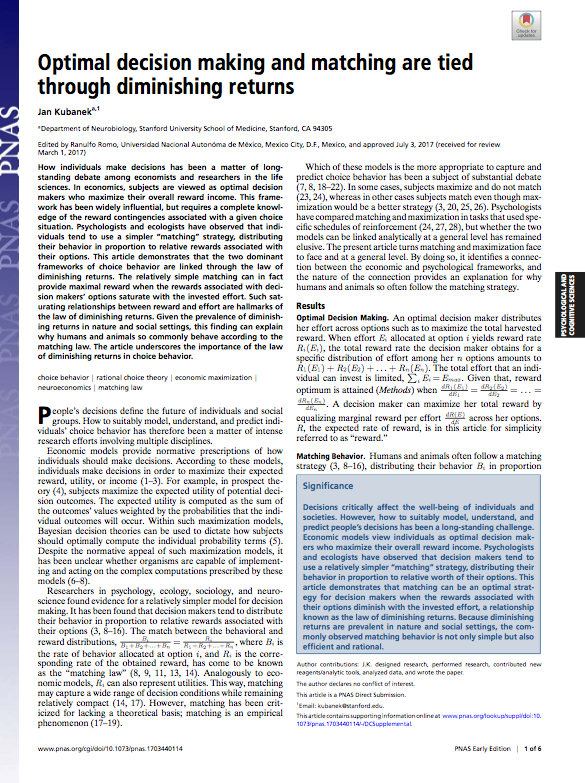 Reward and punishment act as distinct factors in guiding behavior. Cognition (2015), 139, 154-67. PMID: 25824862. Kubanek J, Snyder LH. 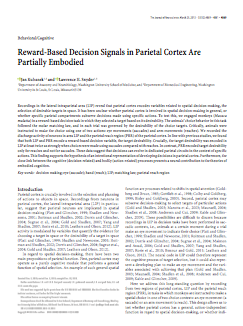 Reward-based decision signals in parietal cortex are partially embodied. The Journal of Neuroscience (2015), 35, 4869-81. PMID: 25810518. Kubanek J, Li JM, Snyder LH. Motor role of parietal cortex in a monkey model of hemispatial neglect. Proceedings of The National Academy of Sciences of The United States of America (2015), 112, E2067-72. PMID: 25759438. 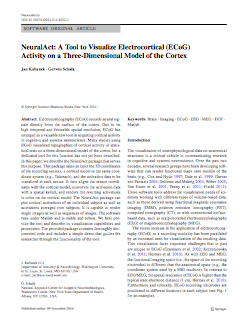 Kubanek J, Schalk G. NeuralAct: A Tool to Visualize Electrocortical (ECoG) Activity on a Three-Dimensional Model of the Cortex. Neuroinformatics (2015), 13, 167-74. PMID: 25381641. Kubanek J, Wang C, Snyder LH. 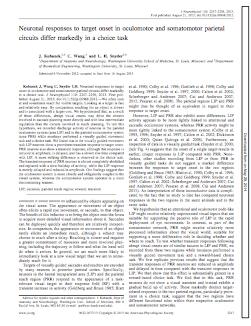 Neuronal responses to target onset in oculomotor and somatomotor parietal circuits differ markedly in a choice task. 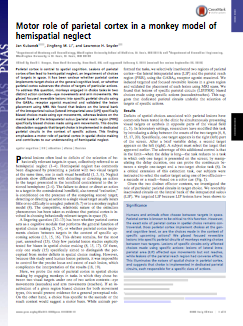 Journal of Neurophysiology (2013), 110, 2247-56. PMID: 23966670. 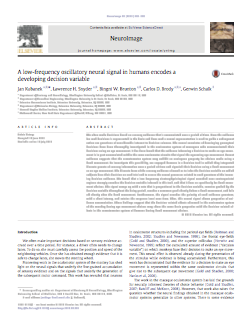 Kubanek J, Snyder LH, Brunton BW, Brody CD, Schalk G. A low-frequency oscillatory neural signal in humans encodes a developing decision variable. NeuroImage (2013), 83, 795-808. PMID: 23872495. Kubanek J, Brunner P, Gunduz A, Poeppel D, Schalk G. The tracking of speech envelope in the human cortex. PLOS ONE (2013), 8, e53398. PMID: 23408924. Kubanek J, Kaplan DM. 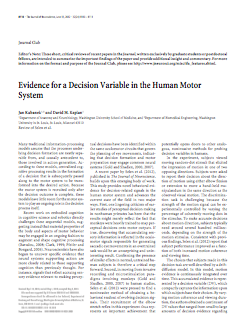 Evidence for a decision variable in the human motor system. 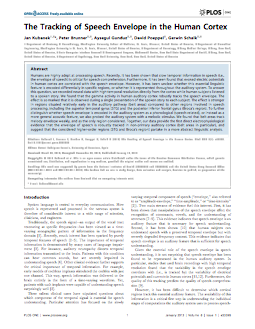 The Journal of Neuroscience (2012), 32, 8110-1. PMID: 22699891. 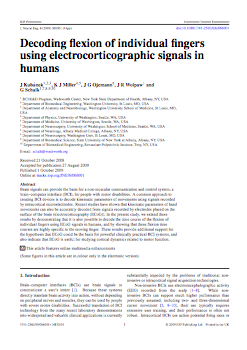 Kubanek J, Miller KJ, Ojemann JG, Wolpaw JR, Schalk G. Decoding flexion of individual fingers using electrocorticographic signals in humans. Journal of Neural Engineering (2009), 6, 066001. PMID: 19794237. 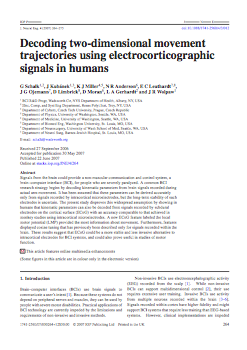 Schalk G, Kubanek J, Miller KJ, Anderson NR, Leuthardt EC, Ojemann JG, Limbrick D, Moran D, Gerhardt LA, Wolpaw JR. Decoding two-dimensional movement trajectories using electrocorticographic signals in humans. Journal of Neural Engineering (2007), 4, 264-75. PMID: 17873429.